Waiting in the grocery store line last night, I started chatting with an elderly woman who was next in front of me. Really, it was rather rude of me because I had interrupted her when I overhead her mention one of my favorite stores to another gal in line. 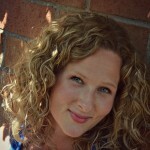 Before long, we were all talking together and as she left, I felt incredibly blessed by our short conversation. Fast forward to today in Costco, with our youngest. She was riding in what we like to call the “big part” of the cart and I was zooming up and down the aisles, grabbing what we need while simultaneously handing her samples. A stranger came up to me and said “Congratulations!” I paused- what the heck? Does he think I’m pregnant?! Then he went on to say how sweet my daughter is. I thanked him, sighing in relief that it had nothing to do with pregnancy- since I am NOT. More isles, more nice people. A full store. People rushing to get all their Thanksgiving stuff, but still having enough time to just be kind and again, little conversations with people showed me that yes, there is still so much good in the world. Those people don’t know me or my beliefs. We probably don’t even agree on lots of things, but does it matter? No. What matters is being able to slow down enough to show people that they are seen, appreciated and important. 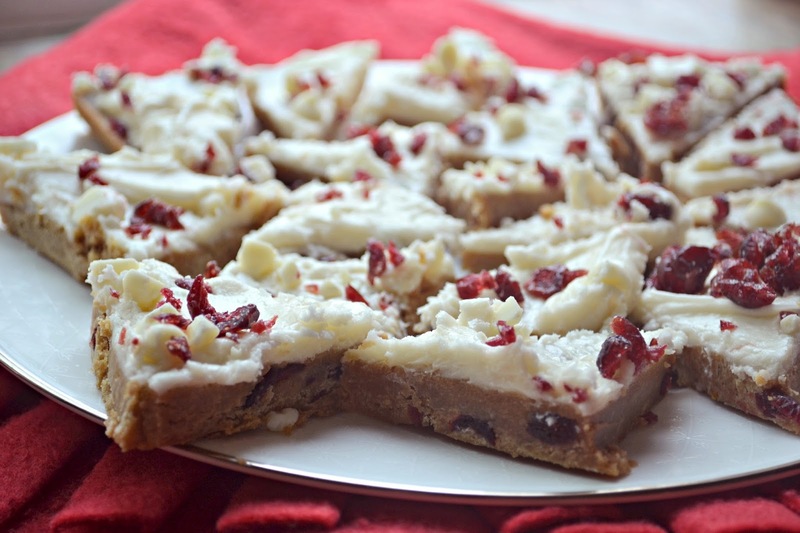 I am so thankful that as we embark on this Holiday Season, I’ve already seen a lot of kindness amidst the chaos and so…..Cranberry Bliss Bars! Ha! These have nothing to do with my story, except for the fact that I was so happy from the conversations I had today, that I went zipping thru Starbucks to pick up a Grande Christmas Blend and treated myself to one of these. As I ate the last few bites, I remembered this recipe and all the way home, I wondered if it’d be appropriate to share it here. See, these aren’t healthy, but they are just as good as the real thing and you can make them in your own kitchen. You can wow your neighbors with them or maybe give them as gifts. No matter what you do, they’ll be loved, I promise. In a medium microwave-safe bowl, melt the butter, about 90 seconds. To the melted butter (allow it to cool slightly so you don't scramble the egg), add the egg, brown sugar, vanilla, and stir to combine. Add the flour, salt, and stir until just combined, taking care not to over-mix or the bars will be tough. 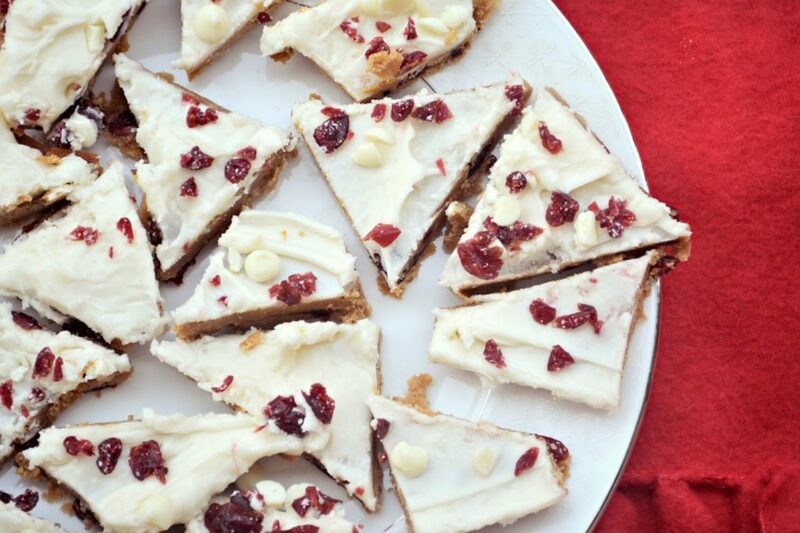 Fold in 3/4 cup white chocolate chips, 1/2 cup cranberries, orange zest, and stir to combine. Pour batter into prepared pan, smoothing it lightly with a spatula or offset knife if necessary. Bake for 18 to 21 minutes, and center is set and golden or until edges begin to slightly pull away from sides of pan, or a toothpick comes out clean; do not overbake. Allow bars to cool before frosting them. While they cool, make the frosting. In a small microwave-safe bowl, melt the white chocolate on high power, about 1 minute, reheating in 10-second intervals, or until it can be stirred smooth. White chocolate is notorious for scorching so melt it very carefully, and slowly, heating in quick bursts, and keep a watchful eye; use a double boiler if that's easier. To the bowl of a stand mixer fitted with the paddle attachment, combine cream cheese, about three-quarters of the melted white chocolate (about 3/4 cup, just eyeball it), 2 cups confectioners' sugar, vanilla, and beat until smooth and fluffy. Start by mixing on low speed so sugar doesn't spray, and then beat on medium-high for about 3 minutes. Mixture will seem stiff at first but will loosen and fluff up after 2 to 3 minutes of beating on medium-high; stop and scrape down the sides of the bowl as necessary. Add additional confectioners' sugar (I used about 2 3/4 cups, I like it on the thicker side) based on taste preference and desired frosting consistency. 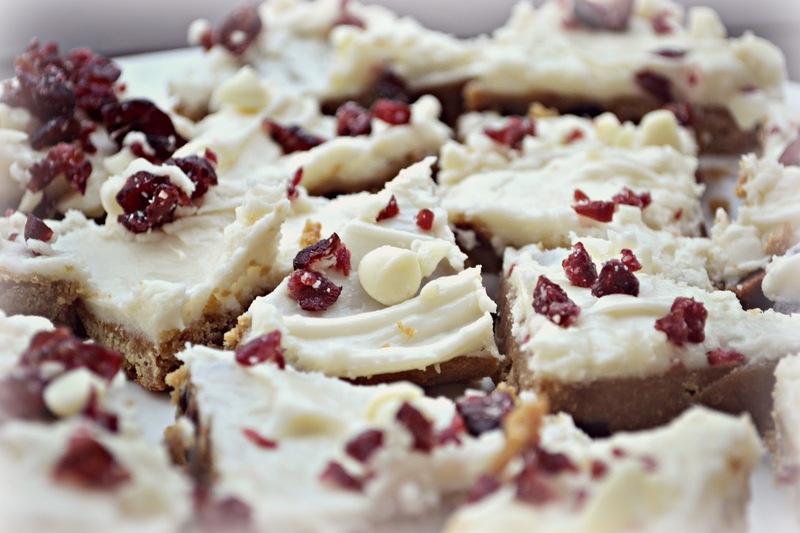 Evenly sprinkle 1/2 cup cranberries over the top of the frosted bars. Evenly drizzle with remaining melted white chocolate, reheating for a few seconds in the microwave if it has set up. Allow bars to set up for at least 30 minutes before slicing and serving. Bars may be stored in an airtight container in the refrigerator for up to 1 week. This look wonderful! Thx for posting the recipe! You are so welcome! Hope you love them! 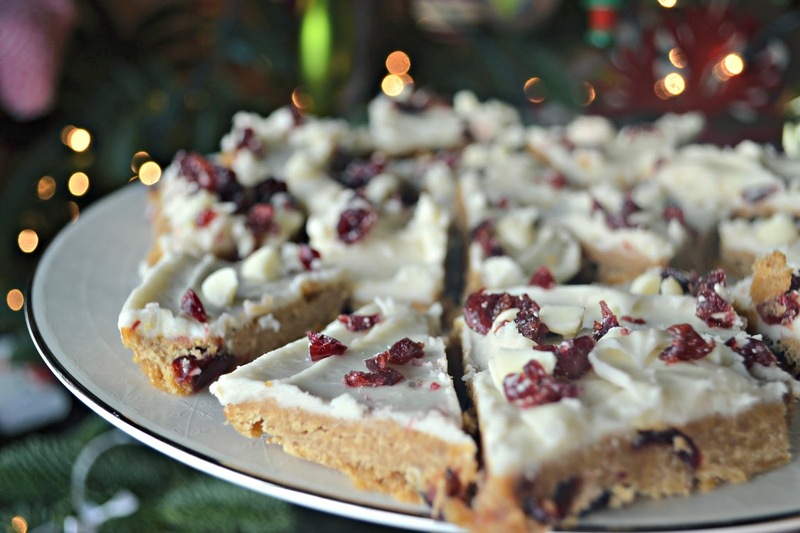 I made them over Thanksgiving – we loved them but the only thing I would change is not having so many white chocolate chips in the topping as it made it a little too sweet for my liking, but I am going to make them again over Christmas for sure. Thanks for posting this.